2017 Snail Darter 1 Mile Sprint and Kids 0.5 Mile Sprint -8th Annual - Wednesday, October 11, 2017. Race Start at 6:00 PM. The C.O.W.S. 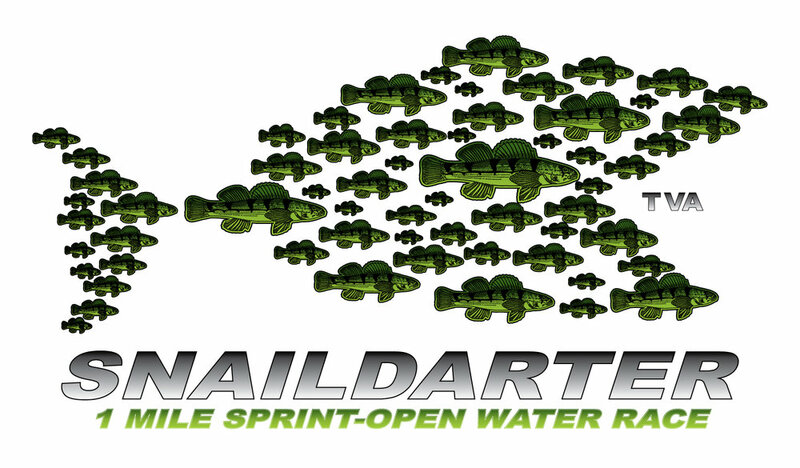 8th Annual Snail Darter 1 Mile Sprint Open Water Race, part of the RiverRocks Festival, is a 0.5 mile or 1.0 mile downstream swim held in the TN River along the downtown Chattanooga Waterfront. The race will be held Wednesday, October 11th, 2016 at 6:00 pm (arrive at 5:00 pm). There is a youth division (0.5 mile of 1.0 mile) and adult division (1.0 mile). Fast kids can choose to register for the adult division. Registration Online at Its Your Race ($15) in advance or onsite before the race for $20. Check in at 5:00 pm at the Delta Queen and Race Jump at 6:00. Please also bring friends to kayak pilot for the event. Kayaks provided by Outdoor Chattanooga. Must be a triathlete or competitive swimmer. Minimum age for Kids Swim = 6. Parent or adult friend required to kayak for 6-10. Kayaks provided for this swim. Bring your friends to kayak pilot please! We need them. 1) No later than 5:00 p.m. arrive and find parking at Coolidge Park. Pay to park. 2) Check in at the registration desk from 5:00-5:20 under the Market Street Bridge at Coolidge Park next to the river and get body marked. 3) There will be a race course swimmer and pilot briefing. Rules = no swim aids, no wetsuits, no mp3s, must wear a brightly colored cap, please bring one or buy one at event. 4) At 5:35, kayakers will paddle upstream to the GPS dock. Swimmers will leave all of their things in the Outdoor Chattanooga Kayak Locker at Coolidge. Swimmers should wear flipflops and then walk to the GPS dock. THANK YOU GPS. Flip flops and other small items will be shuttled for you to the swim finish. 5) Race Jump at 6:00 p.m. at the GPS dock. There will be a water start. ROUTE BELOW. The 0.5 Mile Sprint Route for Youth is downstream only - from the GPS dock to the Market Street Bridge finish at Coolidge. The 1.0 Mile Sprint has a ~400 yard upstream portion, around a buoy, and then downstream. 6) Turn left and swim upstream from the GPS dock 0.215 miles towards a large orange buoy. It will be parallel to about the 5th house of Heritage Landing. You must swim around the left side of the orange buoy, circle it and turn downstream. 7) Swim under Veteran’s Bridge, Walnut Street Bridge and Market Street hugging the North Shore towards the large orange buoy. 8) Finish under the Market Street Bridge at the kayak launch. It will be an out of water finish on the actual ramp. 9) Tacky trophies at the finish at 6:30.